We set aside time to get to know you and your dental health goals. We accept many insurance plans and offer flexible financing plans. Our comprehensive services help you get and maintain the smile of your dreams. Be comfortable during your procedure with our relaxing sedation options. 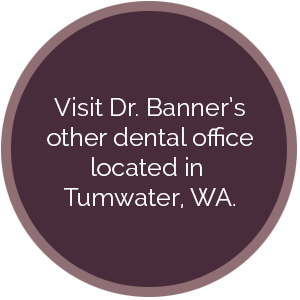 Greenwood dentist Dr. Lael Banner and the team at Banner Dental are dedicated to providing Seattle families with quality, comprehensive dental care. Your comfort is our top priority, which is why we offer a variety of modern patient amenities – including WiFi throughout the office, TVs in every operatory room, and music headphones during treatment – cutting-edge dental care technologies, and relaxing sedation options for patients with dental anxiety. We believe in efficient and effective care. We take the time to get to know you, your health history, and your goals for your smile, and use this to provide you with personalized treatments that fit your needs and your budget. Our convenient early morning hours and family-block appointments make scheduling your family’s dental visits a lot easier! We are also very insurance friendly and offer flexible financing to fit any budget.